Steve, Consulting Principal with Fujitsu, is a strategy, business transformation and culture management expert. Justin is one of Australia’s leading adventurers and motivational speakers. In this inspiring yet pragmatic experience you will learn how to drive organisational growth, through evolving your leadership style and skills to match the needs of each stage of the growth journey - for your company and your self. 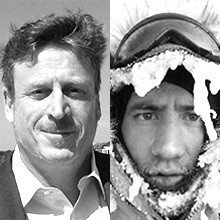 With such diverse backgrounds, Steve and Justin deliver a potent blend of business experience, leadership tools and methods and “real life” lessons learnt from some of the most extreme and hostile environments on Earth – including the boardroom.